Early Swiss / Italian Post Office and Telegraph Office Hand Key. Circ 1860 - 1900. This is a beautiful early Swiss / Italian Post Office and Telegraph Office heavy brass key with 1/2” X 5/16” X 4-1/2” straight lever with an adjustable pull-down spring beyond pivot. It has a doorknob shaped knob and make only contacts although the original wiring looks like it was set up as a break in key. Huge adjusting screws. 5-7/8” X 2”-13/16” Mahogany and Boxwood base with recessed wiring. Greg Ulsamer, DL1BFE, reports that this kind of key was first made in the 1850's by a Mechanicus by the name of Kaufman in the town of Solothurn and later by the 'Eidgenoessische Telegraphenwerkstaette' which was the workshop of the (governmental) Swiss Telegraph Administration. Since many of these keys are found in Italy, it has previously been assumed that they were Italian. This beautiful tiny linesman set which measures only 4" wide x 4 3/8" deep and 2" high made by F Rosati in Milan between 1865 and 1900 is an extremely well made instrument. This example with the number 38 embossed in the right hand corner of which I can only guess is either the line number or the linesman's number. It is a combination set with twin horizontal Sounder coils which relay the incoming message when the key is in the rest position and is inoperative when the key breaks in to send. There are terminals marked "L" for Line, + "Positive and - "Negative". Siemens Bros in London made a similar looking set during the same time period but the typical Italian design of this set makes it stand out from the Siemens version which overall looks chunky and lacks fine detail. Italian straight key by Allocchio Bacchini A/320 circ 1930. This straight Italian key manufactured and built in the 1930s by the company Aero-technique of Rome. This key was supplied to the Regia Aeronautica (Air Force) and Director Guard before and after WWII and was used almost exclusively with Allocchio Bacchini equipment. After the war it was also the key used by the RT security forces who really praised the construction and handling. Its design is similar to keys used by the Italian Post Office although those had wood bases and didn’t have the distinctive tear drop shaped spark guard that this key is known for. The large black Bakelite base has two holes suitable for fixing on the countertop. 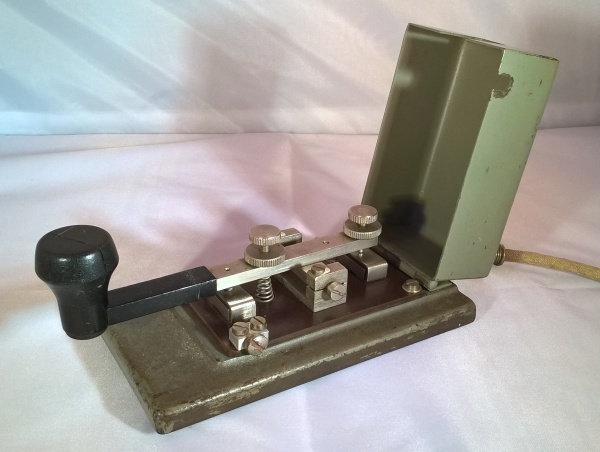 This key is difficult to find and is sought by telegraph key collectors and amateurs. Unfortunately, the label on this example is missing but is still a great addition to the collection. This straight key was manufactured and supplied to the Liga Obrony Kraju better known as LOK which translated is the Polish National Defence League which was founded on 13 Nov 1962 and used mainly in the post-war military and paramilitary training. Manufactured in Poland but is clearly based on the famous long armed Swedish keys. It is constructed on a heavy cast iron base, painted either silver or green with a ball knob of red or white. It also has a similar spring arrangement to the Swedish Military and British NATO Naval Key in use after the war. It is a good solid key with this example being in great condition. The above information and key was supplied by Stan SP6JOE, another collector who specialises in camelback keys and lives in Poland. Polish Military Key circ 1960 – 65. Only one of a few Morse keys made in Poland, this key was made around 1960-65 and is not commonly seen, in fact it is the only example I have seen. It is a simple key with cover which bears the logo ‘WZN’ and Zegrze underneath. WZN means Wojskowe Zakłady Naprawcze translated to Military Facilities Works (Military Repair Plant). This factory existed between 1959 and 1982. Zegrze is an area which is 30 km North of Warsaw, this key was made earlier than the famous polish key called "bocian" Stork Key. The cable and T-11 plug is original. This is a French key that is based on the French Post Office design of 1882, though it could have been produced until just after 1900. This design of this key is shown in the book "L 'Electricite", by Baille, 1883. The fulcrum pin of this particular key is threaded and screws into the lever. French PTT Key circ 1900. This French PTT key is from an unknown manufacturer and has similarities to both the model 1882 and model 1907. Contact gap adjustment is made by a knurled thumb screw as in both models but I do have suspicions about some elements of this key, with some components seem to be out of place. 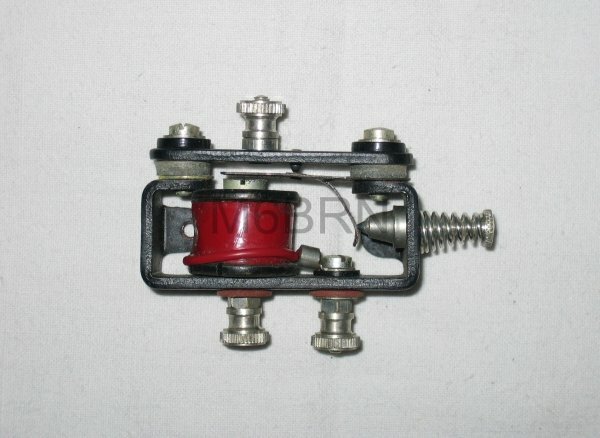 It has an extension spring which, when tensioned, is locked in position by a screw through the side of the arm. 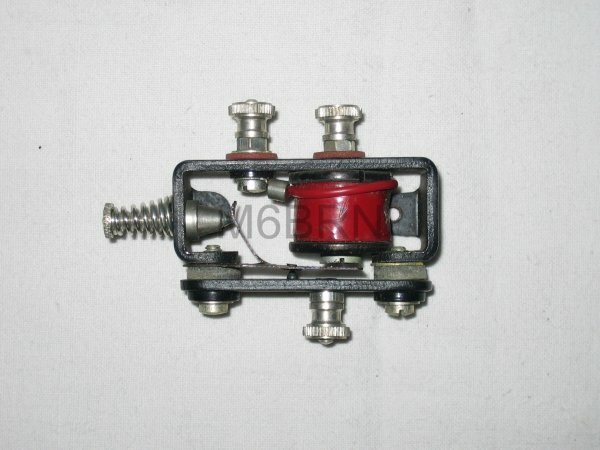 The spring anchor point is not right with the spring soldered to a plate with two screw holes, but no corresponding holes are found in the base. There is a wire from this plate which is also clamped under the head of the fulcrum block securing screw. The fulcrum adjustment consists of a fixed screw on one side and an adjustable thumb screw and locking nut on the other with the fulcrum pin being held by a locking screw on the top face of the arm. There are also screw holes in the block that don’t seem to marry with anything but could be for securing a leaf spring like that of the earlier model 1882. This leads me to think that this has the fulcrum block and base from a model 1882 and the arm, due to its spring setup, from the later model 1907. This probably came about when a leaf spring broke and no replacement could be sourced, so a different arm was fitted and the spring taken through the base and secured as it is now. Any further information on this key would be greatly appreciated. This French key manufactured by Dyna from 1947 is the Mk 2 version of the American. It has a cast aluminium base with the Dyna logo cast in the left hand corner near to the contact. This key has slight differences from other examples I have seen and has a solid arm similar to that of the Dyna Marine key of 1938 rather than the folded sheet steel ones seen on other 'American' style Dyna practice keys. It is a nice key but does need mounting on a base to prevent it tipping forward when operating the long arm. Christian F9WT corrected my description of this key and has informed me that this is a Mk 2 version manufactured from 1947 not 1938 as previously stated, I thank Christian for his input and correction, a link to his wonderful collection of keys, especially French keys, is available on my Links page. 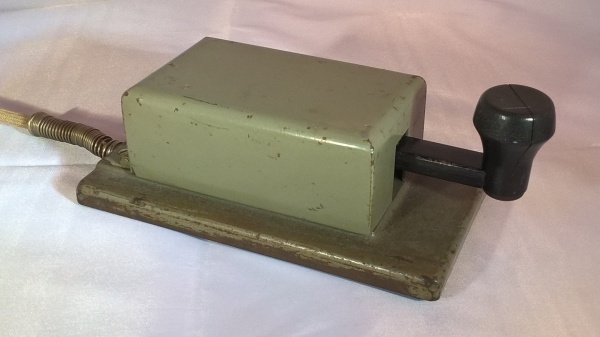 The Dyna Buzzer first made it's appearance around 1932 and was used for training in reading the sound of Morse Code, the search for a significant point on a crystal when tuning a crystal radio or the construction of a wavemeter. This example is as new and came with it's instuction sheet showing differant ways of wiring for differant applications. They are often seen mounted on a practice key or an a seperate small base. The sheet has a date code at the bottom of March 1957 and dates this Buzzer around this time. French Spark Key circ 1920. This key is assumed to be of French origin, due to the design and its similarity to the French military folding spark key from WW1. It has ceramic bead insulation on the line from the insulated, replaceable upper spark contact and also positions for a continuity strap between the arm and pivot block which can also be seen on the folding key. There is no indication of manufacturer so the origin is just an assumption. Any further information on this key would be greatly appreciated. French DYNA Marine Key 2nd model circ. 1947. French key ‘MANITONE’ manufactured by DYNA 1954 -1989. Manufactured by DYNA was the famous MANITONE. It was sold around 1954 and was still on sale in the 80s along with the MANIFLEX a double contact key which uses the same principle of lateral manipulation of the "double speed key" or "side swiper" Bunnell manufactured in the United States in 1888. 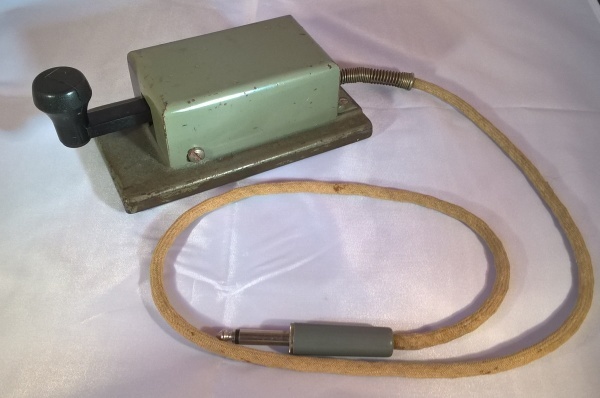 MANITONE's were available in several versions: naked, with a hood and cord, simply suppressed or double outlet with cord. The model fitted with the hood equipped planes such as the CARAVELLE. Suppressed models were approved by the Navy. In financial difficulties since 1983 DYNA closed its doors in December 1989 after 68 years of activity in the service of radio. 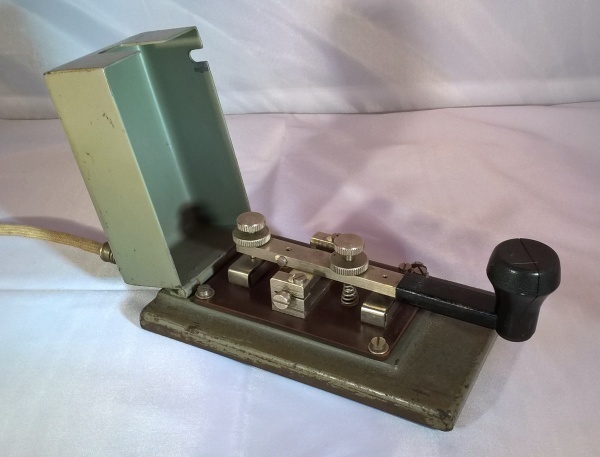 But the DYNA name will always remain in the memory of old radio operators who have all used, at some point in their career, one or other of these famous French manufactured Morse manipulators which sent millions of signals. 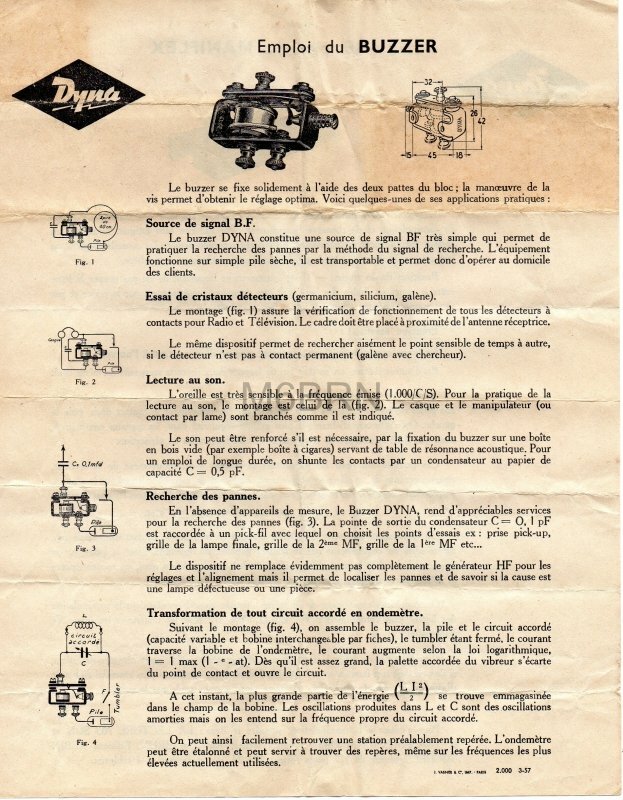 DYNA have been delighting French operators, both professional and amateur for over 60 years. Now fallen into disuse, except for a few collectors and operators hungry for the nostalgia for the good old days of radio. This key has a great soft feel and very easy to use, I like it. This homemade practice telegraph set was made either in Hungary or by a Hungarian as can be seen by the code reference panels. The coil and battery holder is homemade as is the switch unit but both the key and buzzer are commercial units. There is a plug which can be docked into either the two red or two black sockets. The ends of the adjoining wires have banana plugs which appear to fit into the short tubes, these in turn fit inside the coil. Looking at the wiring underneath I am yet to see the purpose or functionality for the coil, although there is continuity through the wiring and components, this does have me baffled. I have so many unanswered questions regarding this set so if there is someone who can work it out I would love to hear from them. I am also yet to identify the beautiful small chrome key which has replaceable contacts. It has a maker’s logo of BF or BP with an accent over it or it may be birds wings, all encompassed within an elliptical circle. I feel that I have seen one before but just cannot place it. It is a great example of a homemade set from the 1920’s or 30’s. 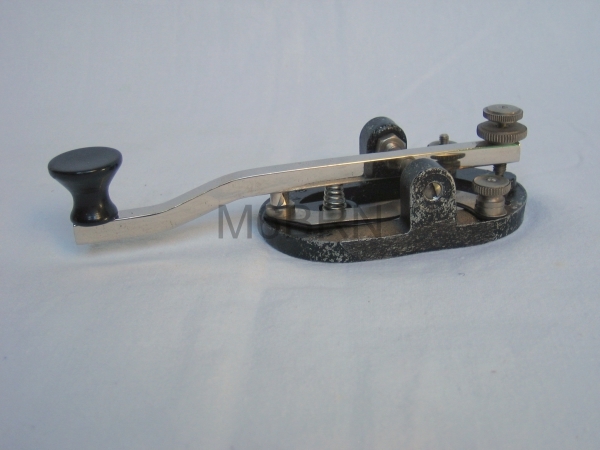 Zellweger (ZAG) developed this key primarily for the FL40 Radio Set in 1939. It is a table model key on cast iron plate with metal lid. The electrically identical portable heavy stations TS40 and KL43 (short-long station 43 or G-station) had the same model.) 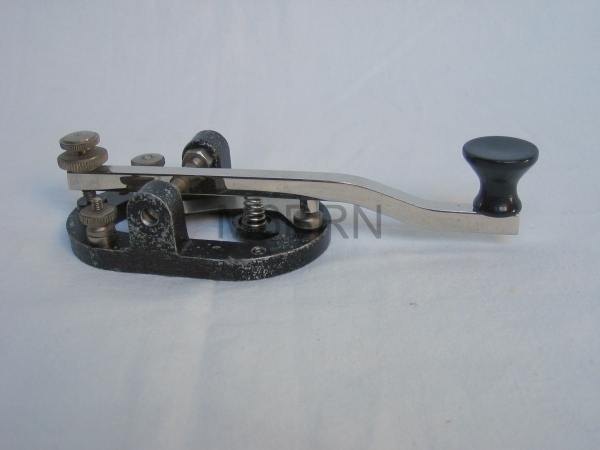 This popular key was subsequently used by the SE222 and the SE-415 radios. The complete wireless station came installed on two one axis carts, one of them called "apparatus trailer" with all electronic equipment and an attached telescopic antenna and the other one "machine trailer" with a fuel or electric driven generator providing all necessary voltages and space for all necessary accessories and antenna components. The transmitter covers the long wave ranges 190-242 / 242-400 / 400-715 kHz and the shortwave ranges 1500-2300 / 2300-3300 / 3300-4500 kHz, a crystal permits to calibrate the set for 4000 kHz. For shortwave use, the FL40 uses a telescopic mast attached to the "apparatus trailer", a seven parts mast made from plugged elements or a L antenna erected between two 10 m poles, for long wave, the latter antenna arrangement is used, too. The station is powered from a petrol operated or electric motor that can be coupled to a special generator, the three phase electric power (50V / 150 Hz) is fed to a rectifier to generate the necessary plate / anode voltages of 300 and 1250 Volts for the transmitter and the anode / HT voltage of 120 V for the receiver as well as 6 V for the heaters and accumulator charger. An inverter generates the necessary 120 V anode / HT voltage for the receiver E41 in case the generator is switched off or for remote operation of the station, a 6 V accumulator will also be used for heaters operation directly. The FL40 Radio was phased out in 1961 and replaced by the famed SE222. This key is documented in Gregor Ulsamer’s wonderful book “Faszination Morsetasten” page 52. European Hand Key circ 1925 – 1940 - Manufacturer Unknown. This key has me puzzled as far as its country of origin, to me it looks Italian but the knob may be throwing me off somewhat and of which may not in its self be original as the threads are quite loose. I have checked the threads and in themselves are not conclusive with two of the threads measuring as follows. 0.152” dia. x 36 tpi which could make it a No7 ASME Standard or a M4 x 0.7 pitch Metric Coarse. The other is 0.106” dia. x 48 tpi which could make it a No4 ASME Standard or M3 x 0.5 pitch Metric Coarse but I am edging towards it being European. It is a “Make” only key with two terminals and has ¼” dia. copper tipped replaceable contacts which would make it capable of handling large voltages and currents on early transmitters. It has a marbled red / brown Bakelite base of which I have mounted on a light, varnished timber plinth. The key itself has a wonderful light feel and is a nice addition to the collection.